Members of Drew's Crew at the 2010 Baldwinsville Relay for Life fundraiser for the American Cancer Society on Friday, June 18th. One of my sister Linda’s favorite sayings was to make lemonade from lemons when Life knocks you down. 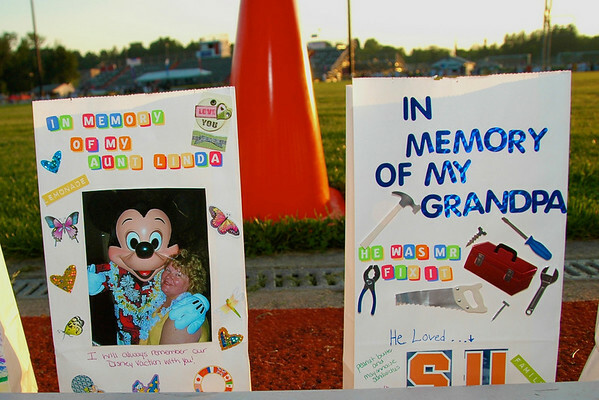 This is what my team, Drew’s Crew, did last Friday night (and into Saturday morning) by fund raising for and attending the 2010 Baldwinsville (New York) Relay for Life. We were one team of forty-four. Drew’s Crew ended up the event as the number two team raising $4,410 for the American Cancer Society to help in research to find cures for cancer. 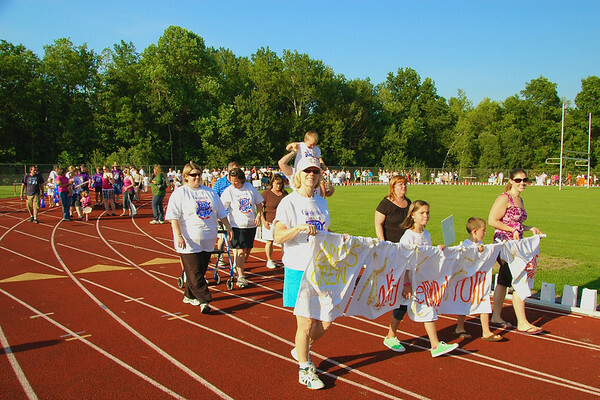 In all, 684 people participated and raised a total of $48,881! Luminaries created by the author's daughter in honor of her aunt and grandfather who both died of cancer in the last year. My daughter created these luminaries for her Aunt Linda and her Grandfather. Both died of cancer in the last year. 2010 Baldwinsville Relay for Life Luminary ceremony from the bleachers. The bleacher luminaries spell out the word, Hope. 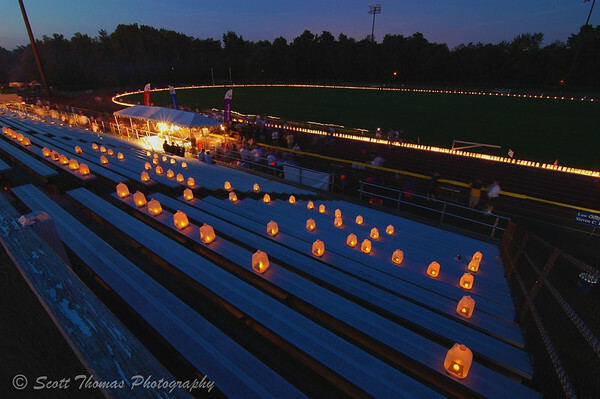 This entry was posted in People, Weekly View and tagged american cancer society, baldwinsville, cancer, event, family, fund raiser, luminary, new york, night photography, nikon D70, Photography, relay for life. Bookmark the permalink. Wow, good job for a great cause. Wow, looks like the event was a huge success. I really love that last shot. Love your daughter’s handiwork. Very sweet. And the lit up luminaries are gorgeous. Way to go Drew’s Crew! That’s a lot of money you raised! Well done! Congratulations on a successful and thoughtful fundraiser! Good for you and Drew’s Crew! It was a lot of fun, and I was impressed with how well they set things up. Such a good idea in every way. Congrats Scott, and thanks for sharing such lovely photos.